Usually 3 or 4-piece. 3 hours playing time. Can play outside and on the move. The Rhythm Kings (who also appear as the more swing-orientated band, Gentle Jazz) are a four-piece band specialising in New Orleans-style and Dixieland jazz, with a line-up of clarinet, trumpet, sousaphone and banjo to provide the authentic sound of the New Orleans marching bands which were the origins of jazz music. To complete the effect, the band can dress in striped waistcoats and straw boaters. For background music, the noise level is sufficient to create a party atmosphere at receptions and functions of all kinds, but not so pervasive as to drown out conversation amongst the guests. 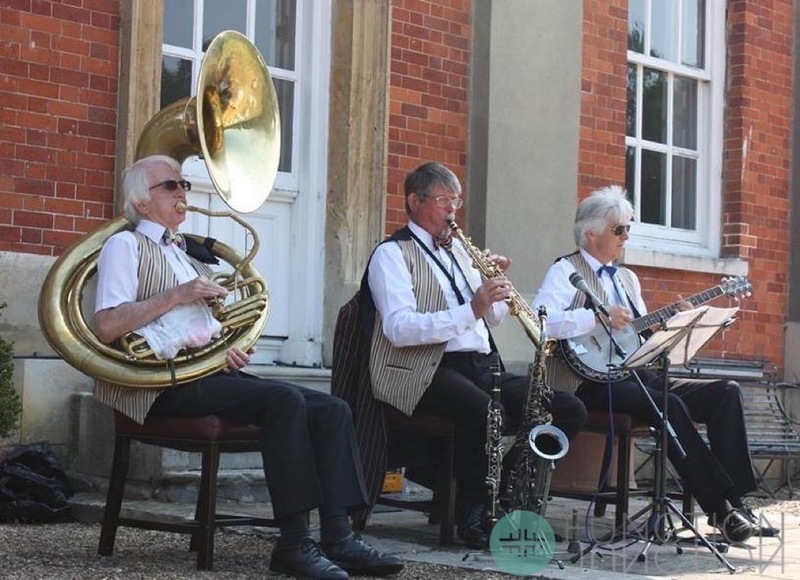 Being a completely acoustic band, The Rhythm Kings are also highly mobile - able to play both in- and out-of-doors and even to stroll around – perfect for garden parties and outside venues. The Rhythm Kings' repertoire covers all the classics of the "Jazz Age" originally made famous by musicians such as King Oliver, Kid Ory and Louis Armstrong, and re-created more recently in the UK by bands led by Kenny Ball, Acker Bilk, and Humphrey Lyttleton. Our quoted price is for the four-piece band, but the band can go up to five or six pieces by including drummer and trombone. They can also reduce down to a trio or duo. The band would expect to stay up to four hours at an engagement, during which time they would play for around three hours. A longer booking can also be arranged. The members of The Rhythm Kings are all highly experienced jazz musicians and the band have played at top venues in London and further afield, including Hilton hotels, Claridges, The Savoy, The Grosvenor House and The Dorchester. 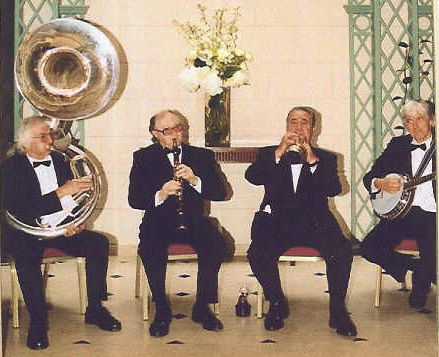 They have provided the entertainment at numerous weddings, parties and corporate functions and have had extended engagements as the house band at both London’s Cumberland Hotel and the Langham Hilton. The Rhythm Kings are based in London. See Pricing for details of travel costs, etc. "We had a wonderful day and the music was a real highlight. Lots of guests have commented on how much they enjoyed the band and the ambiance you created was just what we were hoping for. We will be sure to recommend you to our friends." "The standard of music was of the very highest. Their song choices were perfect for the weather, the setting and the mood of the guests. They brought a great deal of fun and style to the occasion and created a wonderful atmosphere. Most everyone we spoke to made a point of mentioning how good they were. We thought so too! ps. We loved their outfits!" "The act were fantastic! They made my day." "I wanted to let you know that the band were excellent at ... and we had some lovely comments on how everyone was enjoying the music." "Really great group of guys that made our wedding very special - thank you." "Rhythm Kings made a valuable contribution to an excellent day all round - thank you!" "We thought the band were really great – many thanks." "Hit just the right note for a summer afternoon. Many compliments from the guests. Superb." "Excellent band and very nice men." "Excellent performance, excellent energy, attitude and skill. Really did make our afternoon. Will definitely recommend. Thank you." "We were thrilled with their performance. The act in church went down extremely well with all the guests and the second act back in the garden was also great! Many thanks to the trio for being such an important part to our day." "My wedding guests were about 30 - 40% professional musicians, all of whom commented on how fantastic the band were! Everyone really enjoyed their playing. They were perfect!" "The band not only sounded brilliant but looked fantastic too. They were exactly what we wanted and we've had loads of compliments about them from wedding guests of all ages. They got our reception off to just the right start."